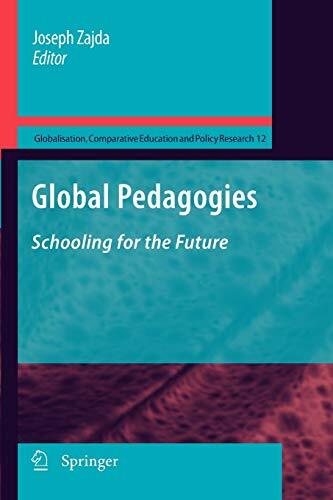 This book reviews conceptual frameworks and methodological approaches in comparative education, focused on globalisation, educational policy and classroom pedagogy. This is the 12th volume in the series Globalisation, Comparative Education and Policy Research. In a postmodern world characterized by flux and uncertainty, parents often view education institutions as a major, if not the only, provider of moral certainties for their children. Yet ironically, as these expectations of schools and their staff have increased, conservative-minded governments have attenuated the ability of schools to achieve them, through funding cuts, centralization and the blunt instrument of league tables. This volume, the twelfth in the Springer series Globalisation, Comparative Education and Policy Research, analyses the role schools might play in the communities of the future. The contributors argue that, globally, education and pedagogy in particular, as that sphere of human activity most concerned with the deliberate way in which consciousness and conscience is formed, and identity inculcated, has the capacity to contribute significantly to a world in which social justice, tolerance and care for the environment become the dominant social paradigm. As with the others in this series, the aim of this volume is to provide an accessible and practical, yet scholarly source of information about international concerns in the field of globalisation, global pedagogies, and educational transformation. Readers will find here the very latest thinking on these issues, discussed in the context of global culture. The chapters provide directions in education, and policy research, which will be relevant to transformational educational reforms in the 21st century. The book&#x2019;s two sections focus first on main trends and issues around the world, before moving on to explore the interplay between education and the concepts of equality, access and democracy. Researchers and educationalists will find much to ponder, from an examination of the politics of new history textbooks in Russia, to the difference in attitudes to tertiary education displayed by young people from urban and rural backgrounds.